You should probably just leave this tab open until after lunch because this is likely to run your appetite. It's basically the shrieking eels scene from The Princess Bride except instead of human meat they're after pizza. Also, the eels win this time. The video has been viewed more than 2.5 million times since it was posted to Twitter on January 12 without any explanation. 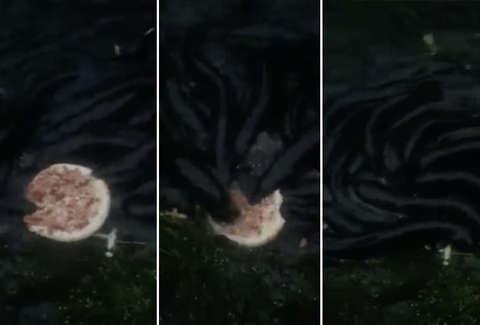 For some reason, a personal-size oven pizza was chucked into shallow water populated by so many eels that even the eels feel like its a bit excessive. They attack the pizza with gusto, fighting over the small pie while making truly grotesque sucking sounds. These eels make Egg Roll Squirrel look like it went to finishing school. The video notably popped up in June 2018. At that time it was shared on Reddit and by Viral Hog, a company sells viral videos on behalf of the poster. Reddit doesn't offer much in the way of an explanation, but according to Viral Hog, the video dates back to April 2018 in Taranaki, New Zealand. In case you thought fighting over pizza was the grossest thing a longfin eel could do, Jeremy Wade's River Monsters makes the case that there are many other terrifying things battling for the title. The list includes migrating over dry land and getting more than four feet long. Hope you had a good lunch.